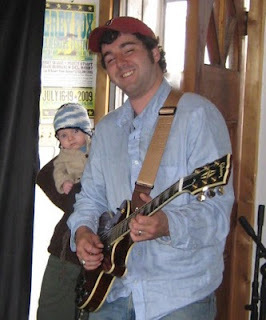 Caleb learning some new licks from dad! I am wondering if Caleb knows his dad with the facial hair! I hope Alan is playing him some Nazareth and some Fleetwood Mac! I mean without the facial hair! Too scratchy for baby cheeks? I don't think Caleb noticed the drastic change in Alan's looks (10 years younger, anyone??) because he did it so gradually - full beard - goatee - handle bar mustache - regular mustache -facial hair free! It's coming back quickly though! Can't wait to blog about Cale's new cousin soon!!! Caleb looks like he's about to say: "Holy Cow.....thats a Gibson Les Paul!! Can't wait to get my hands on that piece of gear! Without the beard I think Alan looks like a Sprague... puts me to mind of Andrew. What do you other people think? That "Sprague" thing was meant as a compliment, no offense to the Jeffries! Beard or no beard, Colleen and I think Alan is great!